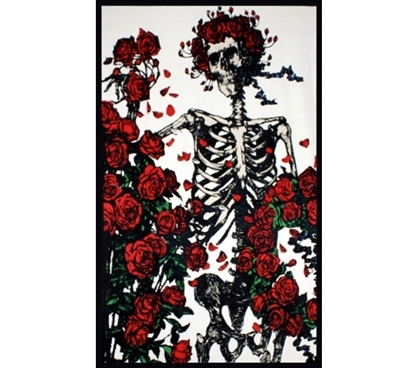 If you love the Grateful Dead, our Grateful Dead Skeleton Roses Tapestry will be the perfect piece of dorm decor for you. The haunting photo of the skeleton picking flowers is reminiscent of the album cover of the band's seventh album, "Grateful Dead." The piece of artwork was originally composed by Edmund Joseph Sullivan, and Alton Kelley and Stanley Mouse went and added color to the black and white photo. Now you can have this cool photo right in your dorm room as a dorm room product that other rock fans at your college will be jealous of. For all the Grateful Dead fans out there, you can relive the band's glory days with our Skeleton Roses Tapestry, a retro dorm accessory. With all the different skeleton artwork that the Grateful Dead used throughout their career, other Grateful Dead fans in your residence hall are sure to see this college tapestry adorn your dorm room walls and admire your fine music taste and appreciate your respect for this American rock band.